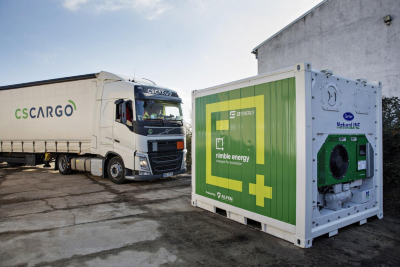 In cooperation with Nimble energy, C.S.CARGO brings the first high-capacity mobile energy-storage unit to the Czech Republic | C.S.CARGO a.s.
C.S.CARGO transported the high-capacity battery to the Czech Republic for the company Nimble energy and its customer CE Energy. The battery will serve to support the storage of electricity and as a power source in the event of unplanned outages. Thanks to its easy handling, the unit can be used according to current requirements as, for example, a more ecological alternative to diesel generators at music and other festivals. “At C.S.CARGO, we have long striven to support sustainable development. One of the steps in that direction is, for example, annual replacement of the vehicle fleet so that our vehicles fulfil the strictest Euro 5 EEV and Euro 6 emissions norms. Therefore, we are pleased that we could carry out the transport of a battery that will help to overcome current obstacles and push development forward,” says Aziz Jahić, marketing director at C.S.CARGO. At present, mobile high-capacity batteries are a possible solution ensuring use of energy on a larger scale – in connection with the operations of major companies, supporting the stability of distribution grids and at one-off events. The battery was manufactured in cooperation with BMW, as battery units from BMW i electric vehicles are used within it. “Demand associated with the development of high-capacity batteries not only for alternative sources of energy is shifting to the Czech Republic. I believe that after returnable plastic beverage cups, which are now part of every larger festival, clean energy sources, such as mobile batteries, will become another feature of those kinds of events,” says Lubomír Kohout of Nimble energy. Prague, 24 October 2018 – In cooperation with Memory of Nations, C.S.CARGO has prepared a special project commemorating the 100th anniversary of the republic. In connection with the initials C.S. in the company’s name symbolising Czechoslavia, C.S.Cargo wants to celebrate the centennial in an original way, by giving ten of its trucks the names of ten heroes of the past century. It thus wants to expand everyday awareness of the actions of well-known and completely unknown people whose courage and steadfastness can serve as an example for everyone in every era. After all, the history of our nation is not formed only by people on a pedestal, but by each of us.